Hello everyone, thank you for checking out my site and learning a little bit more about me. Some of my hobbies are gardening, fishing, hiking and traveling. I had worked in the corporate world for years. Did all the right things. Went to college, got a good job worked hard. After some time I began to dislike my job. Yes I know not an uncommon thing. I could see I was working and no matter how hard I worked my paycheck was never really enough. So what did I decide to do? Well after 15 years of work I decided to go back to school and get my MBA. Again I did it all right, went to a good school graduated with honors, got accepted into the honor society for the school. In my entire MBA program I had straight “A”s. I figured I would graduate and the world would be my proverbial oyster. Life had a curve-ball to throw me. I did graduate but I graduated in May of 2008. You guessed it the recession hit. Now here I was a man in his mid 30’s with two kids and a wife and loads of student loans. So I found a job in my old industry and continued to look for something new. Need to pay those bills you know. Then my wife, of 15 years, had a great opportunity to move to Ireland. So I quit my job and the family moved to Ireland, where I was to care for my children and be a house husband. Not a bad gig, but overtime distance grew between my wife and I. Until we decided to go our separate ways. Once I was again with another curve-ball of life. Now I am in my early 40s, no job for a few years living in Ireland where I don’t have a work permit or anyway of making a living. So I took the next step in my life. A friend of mine was living in China and he and his wife had just started a language school and he needed teachers. I thought well the money will not be good, but at least I can pay my bills. So I packed my bags and moved to China. It was there in China where I met the love of my life and ended up getting married again. I thought I would never do that again but life is fickle that way. I still teach English in China, but the money wasn’t that good. So I started looking into working online, how else was I going to travel. I tried this and that but it was really a shotgun affect. Over time I had ended up spending more money that I had made. Couldn’t really figure it out. No one really to guide or train me. I had two different websites but the best I could do was get about 15 visitors a day after one year. No real sales to speak of. My gross revenue for the year was $68 between the two websites. That all changed when I found free training. No obligation to ever buy anything. They even gave me two free websites. Those websites are always free no matter if I buy something or not. No heavy sales pitch or anything. I began to learn and apply those principles over time. Now for the first time I can see some traction. I will continue to show that progress in future posts. Please drop me a comment below, or you can find me through my Wealthy Affiliate ID Marc1001. If you chose to join I will follow you back right away and I will be happy to answer any of your questions. You give people a lot of good reasons to give Wealthy Affiliate a chance. After visiting your Website, people should have zero reasons not to sign up for a Free Membership at Wealthy Affiliate! Thank you Michael for your kind comment. Good luck to you in your endeavors. That’s a moving story, Marc. I hope both our Wealthy Affiliates experiences turn out to be fruitful ones in the long-run! Good luck with everything in China. Thanks for the kind remarks. China is going great. Keeping very busy and loving the cost of living here. Gosh, you had it pretty rough. I’m so sorry about that. I’m glad you found someone to spend the rest of your life with. I can’t believe that you’ve achieve so much in 30 days. Congratulations on your success of getting this far. Wealthy Affiliate has changed my life too. It’s going to be great when we get to the end of the course. I wouldn’t say I had it rough and I wouldn’t change a thing. Everything that happened in my life has made me who I am today. Without the turmoil I would not have learned new things. I love my life now and am very happy. Thank you for my compliment. 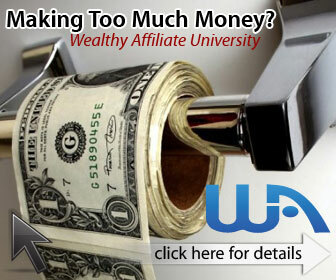 My success is due to Wealthy affiliates and people like you. I loved your story about your journey and meeting the love of your life. There is a moral in there and that is you never gave up, you kept looking to improve your life. Finding WA is another chapter that will lead you to success. Thanks for sharing that with us. Thank you for the kinds words. Yes WA is another chapter in life that has changed my perspective on things and helped me become more successful. Thanks for the comment. Let me know if there is anyway I can help you. I really enjoyed reading the Google changes, etc. Have already bookmarked your site for future “peeps” ! Thanks for the comment. Please let me know if I can help you anymore in the future. Best of luck to you. I am very new at the internet market. where would you suggest I start? I would look at two places. My number one recommendation, Wealthy Affiliate has a free version. They give you two free websites and a great community to help support you. The premium version is a monthly fee of $47.00 but if you sign up within 7 days of creating an account you can get it for $19 for the first month. My second recommendation is Earnest Affiliate. At Earnest Affiliate there is a one time fee for a lifetime membership of $197.00. It is a growing but good platform and does have an active community as well. Both of these options will get you started on the right foot and make sure you dont make any mistakes. Please let me know if I can help you further or if you have any questions about anything. It’s funny that I’m here, reading about you. Maybe it’s just meant “to be” in my life. You see I AM a member of WA. Not for too long tho’. I joined about 3 weeks ago maybe. I had already been looking to “make money from home”and. “TAKEN” by some. Really depressing ! So here there I was a brand New member ! Loving what I saw. Enjoying the time I spent on the WA site. Did I mention my “go to” job,,,I’m a waitress. Don’t get me wrong, I love meeting PEOPLE from all over the world. I enjoy my job or wouldn’t have done it half MY life so far. But THIS WA thing had got me. Any way,,,it came a really great special,,I could join for half of the original I think $47.00, which was only $19.00 I think,,, YAY! I was so excited ! The next day I lost my job, of course I was devastated. Add to the devastation,,my bank account was and still is overdrawn. So if you were to look me up on WA,, you’ll see I haven’t been on much lately.looking for another “go to” job and begging , borrowing to keep car insurance, phone on(in case I get a call for work), and as of right now electric scheduled for disconnect tomorrow, March 7th. I can’t keep, can’t eat. So no I’m not getting on internet nowhere near what I was 3-4 weeks ago. Devastation ! Right now I’m waiting on unemployment. And going to job searches at Career Center. I would apply for food stamps,,it’s just me tho’. There are NO children in my home. Its just me. Hang in there and keep the faith. I wish you all the best of luck with your job pursuit. Life throws us curve-balls, as I said, we just need to adapt to them and keep on going. Overall you will make it through. Please let me know if I can help with your online pursuit in the mean time. I will help if I can. What a privilege to read your story and see how far you have traveled on this winding road called life! You have hit some potholes, but you persevered and that is an inspiration. I just wanted to let you know that I’m a fellow WA member, but I actually found your site through Google! I was looking up reviews of UserTesting.com and you were ranked #1 for the keyword I searched! Way to go! Keep up the good work. Thanks for the comment. This week is a crazy week, so it is taking me longer than usual to reply. I will be sure to follow you back. I used “user testing” to pay my membership fees until I was making enough to cover those fees. Great program. Andrew thanks for the comment and the follow. I know you can make it if you dedicate the time and effort. It is not a get rich quick scheme. Let me know how I can help. Hey Marc, just got your DM on Twitter. I was a little skeptical, but I can see you’re a real dude and honest. Great about me section here man. Thanks for checking things out. I appreciate it. I have been traveling for the past few days so I am sorry it took a while to respond.